Linda Marston-Reid is an artist, writer, and executive director of Arts Mid-Hudson. 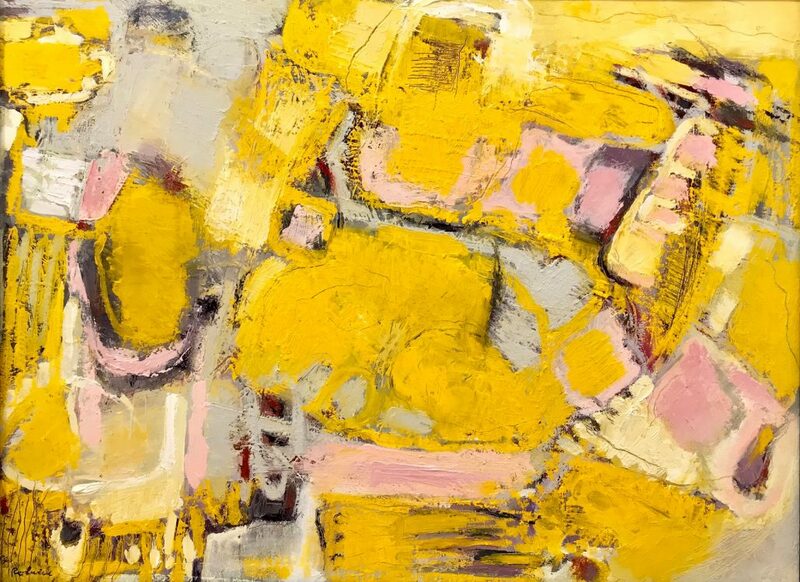 Both exhibits were curated by calling for artists to create an optimistic work of art using International Optimism Yellow (Pantone 108), a color that Uncle Riley developed as a platform for collaboration and tool for creatives to explore and share optimism with others, while raising awareness of depression and shining a light on suicide prevention among artists. The City of Kingston, YMCA, and other groups have been preparing to kick-off Kingston’s Paint the Town Yellow initiative in celebration of International Day of Happiness on March 20. 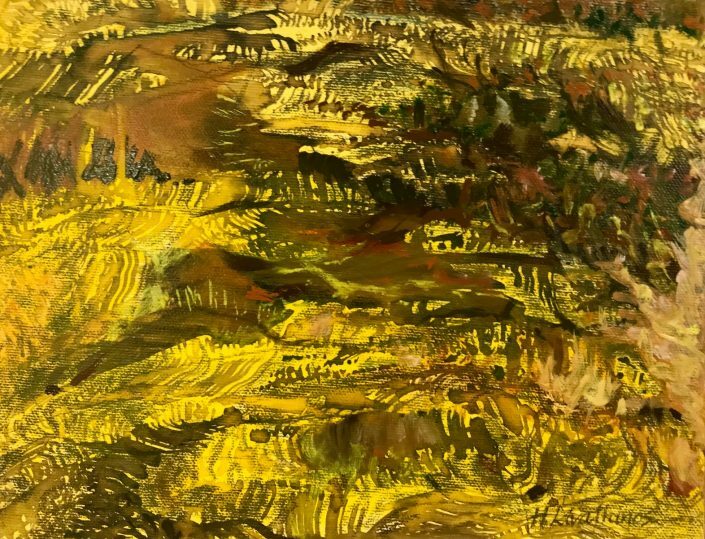 The works in both exhibits shimmer with Optimism Yellow and each artist has taken the medium and created a work of art in their own style. 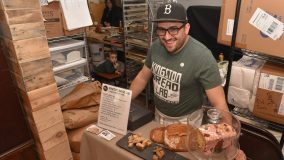 For instance, Matt Taylor uses photo collage to create “It’s Okay to be Kind,” a fantastical street scene featuring Broadway directly outside of ARTBAR. 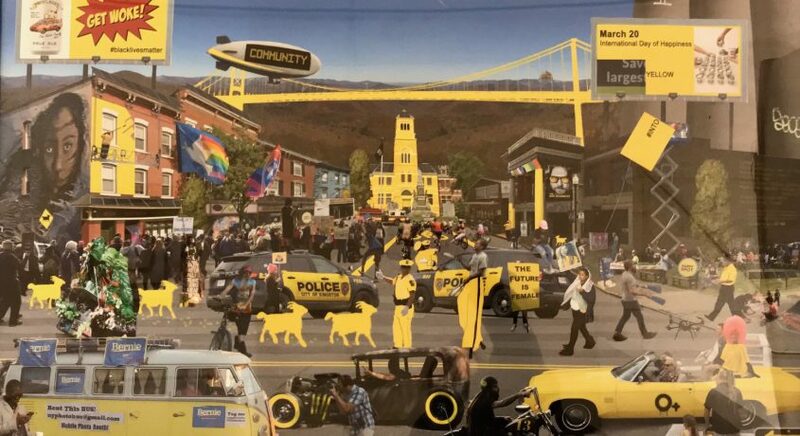 There appears to be a grand street festival happening in the artwork and Optimism Yellow is used to color the police cars blocking street traffic from the festival, as well as the officer’s uniforms. 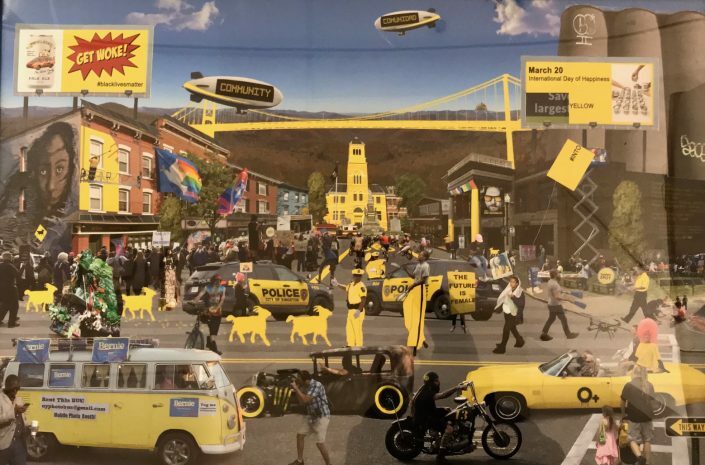 The placement of landmarks is skewed and also depicted in yellow, including Kingston City Hall and the Hudson Bridge. 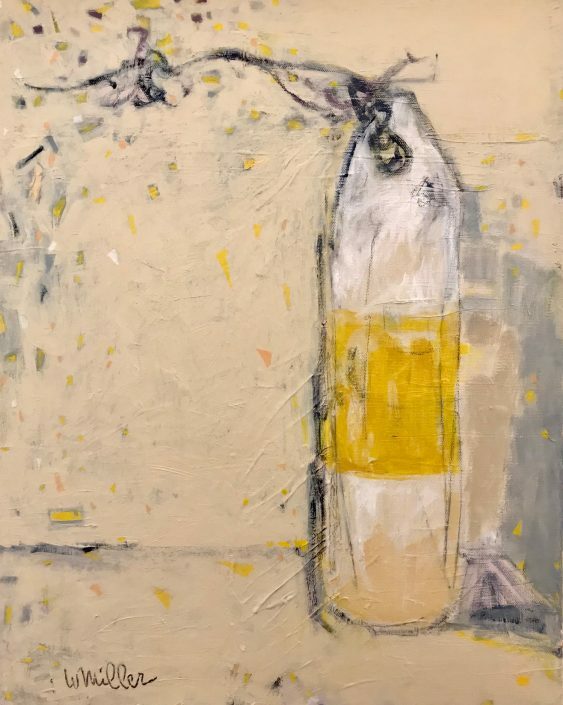 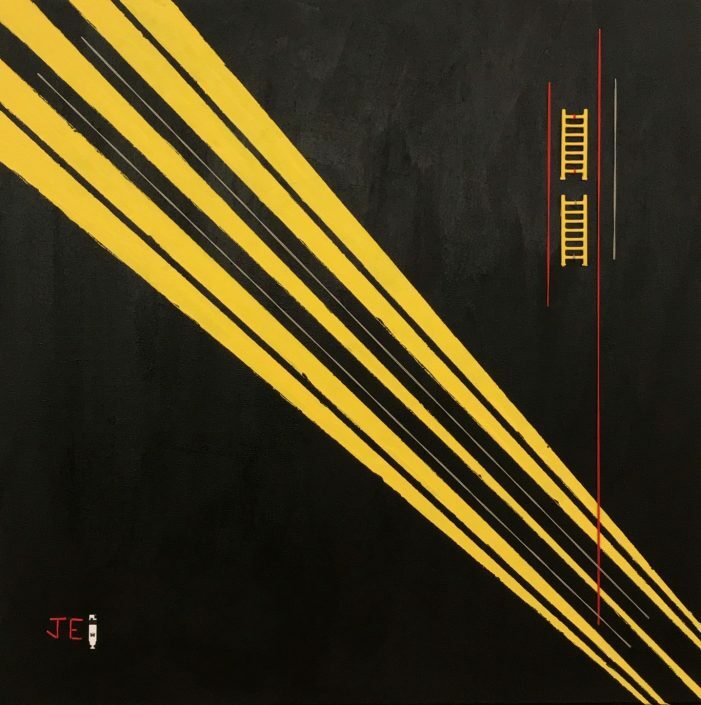 Other artistic approaches include the positive thoughts that the artwork titles convey, including Jess Edelman’s abstract painting, “Ever Upward,” depicting yellow ladders and Wilma Miller’s “Buoyant,” a gestural painting of a yellow and white buoy. 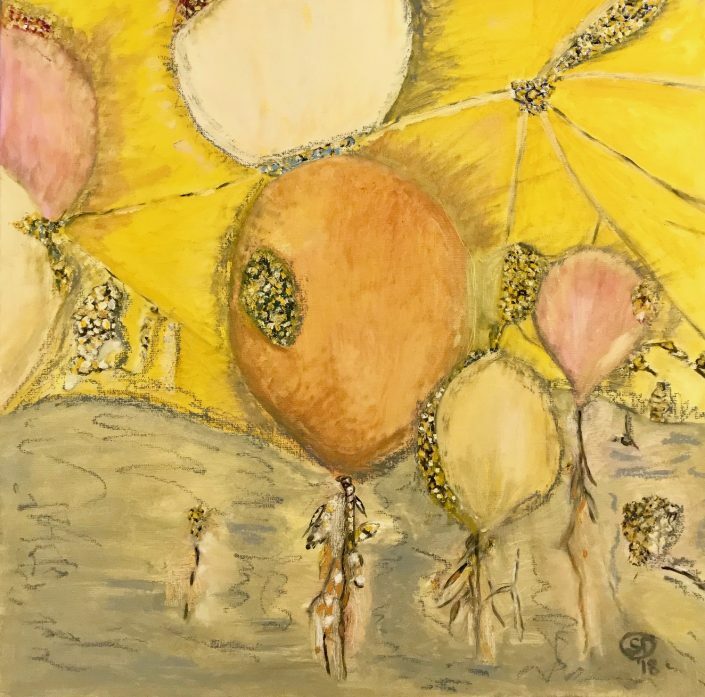 Sharon Dee’s “Under the Canopy” helps us all remember being under a festival tent watching the balloons rise and float together at the peak of the roof. Harriet Livathinos used Optimism Yellow to create “Spring Thaw,” an abstracted piece that reminds us about the hope that spring, with its beauty and new colors, brings to the landscape. 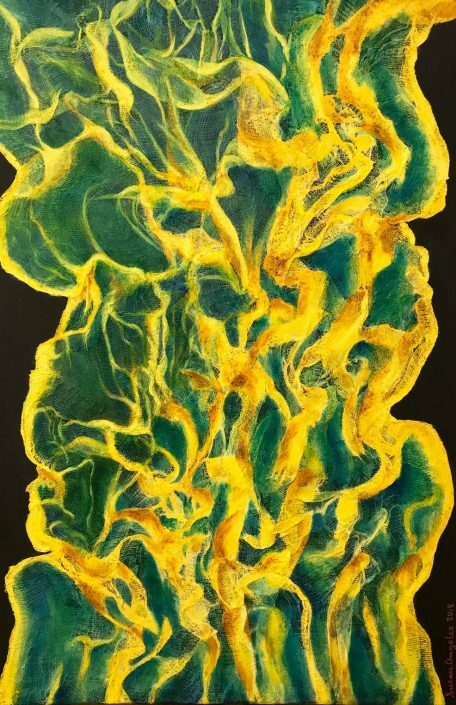 Susan Angeles painting “Excelsior” features an organic shape that combines the yellow and greens of plant life. Leslie Rolnick’s “Meandering Optimism” is an abstract painting with luscious brushstrokes and surfaces enhanced with sgraffito. Special events around the exhibits: March 20th there will be a Mayoral Proclamation and Yellow Ribbon ceremony at City Hall, followed by a Yellow Party at ARTBAR Gallery beginning at 7:00 p.m.
You can get more information on INTO Yellow initiative at www.intoyellow.com.